Cursed monsters have been added to the wilderness. These include hellhounds, jeweled crabs, cave horrors, smoke devils, gargoyles, abyssal demons, wyverns, hydras, krakens, and shamans. Many of the cursed monsters take after their superior or boss variants. These monsters drop both superior items and their respective boss's unique equipment. Unlike most monsters, they will only drop their items while on a wilderness slayer task. A new wilderness event has been added! 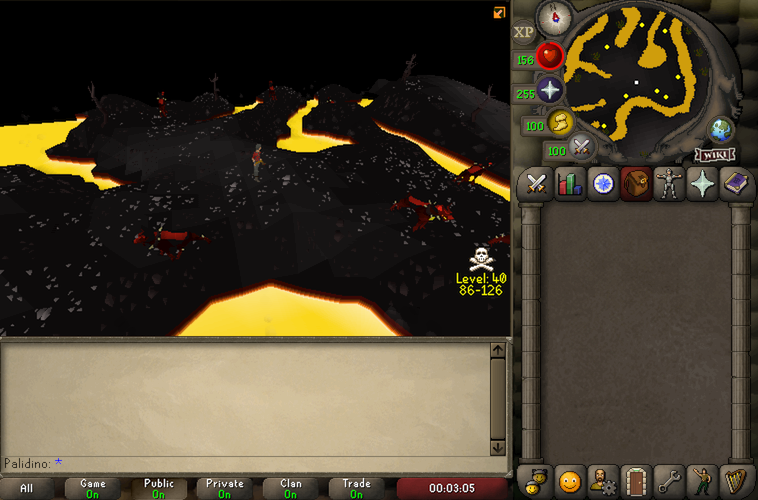 When the event starts, a bloodier kill will spawn at the wilderness volcano. If picked up, you will be skulled with a red skull, your run energy drained, and unable to teleport as long as you carry the key. The only way to claim the key is to take it out of the wilderness by taking it all the way down to level 1. You can't logout while carrying a bloodier key and x-logging will cause your player to drop the key. 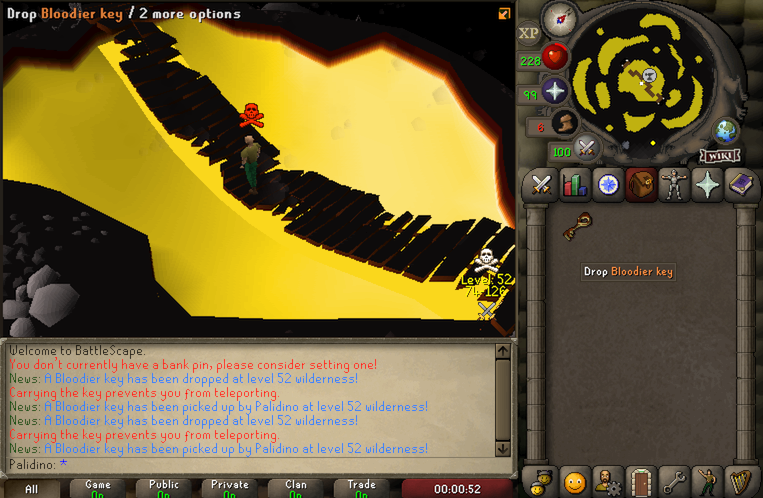 While carrying the key, wilderness combat level restrictions no longer apply. While the key doesn't allow multi-combat in single-combat areas, players attacking you can be attacked by other players at any time. The Chaos Elemental's difficulty has been toned down. This includes removing it's variable attack speeds, reduced special attack chances, and no longer has weaknesses (though void damage is still reduced). Its hitpoints have been raised from 1,000 to 2,500. Its spawn location will also now always be the same as OSRS. You'll no longer be tele blocked and item protect blocked, but instead of dropping a piece of equipment, will now drop a bloody key. The bloody key is never protected on death, and while carried, will prevent you from teleporting. The key can be taken to the chest in Edgeville, and will reward you the same way as the direct drop it used to give. Ironman accounts can now purchase blood money from bonds. The blood money shop has been updated for all game modes. Wilderness task monsters will no longer drop special loot such as blood money and supplies if you aren't carrying an emblem. Tournaments will now run throughout the night and early morning. Perdu will now return food and potions in noted form, which should help clear up some issues. Ferocious gloves can now be reverted using the machinery in the Lithkren Vault. Small improvements have been made to mystery boxes. Fixed map items not disappearing from view when their time runs out. Fixed releasing butterflies not returning the jar. The blood money shop now sells tier 1 mysterious emblems for 50K. Whether you're PKing or doing wilderness slayer, this should make it easier to obtain an emblem to gain the benefits of carrying one. Edgeville wild has been made a hot zone. Inside of a hot zone, emblems will be upgraded even if your opponent isn't your target (so long as they're also carrying an emblem), and also means the restrictions for fighting the same player and being rewarded with emblem upgrades and blood money is only a 2 minute cooldown. Bounty Hunter targets will no longer be assigned if you're more than 6 wilderness levels away from the potential target. The target teleport can be used past level 20 if you're not in combat and if you're within 6 levels of your opponent and also not teleblocked. Normal teleporting rules apply 20 and below. Tournament announcements will now include the mode again. Removed the loot broadcasting from cursed monsters. Pure tournament modes now include more karams and brews. Fixed the Chaos Elemental only dropping a bloody key for 1 player. Fixed the Mage of Zamorak in the Edgeville wilderness. Last edited by Palidino; 1 Week Ago at 10:07 PM. Good luck wilderness peeps. i will cheer from the sidelines go go go. Cool update! Looking forward to the increased complaining in the Home clan chat about PKers attacking PVMers in the wilderness haha. Would be sweet if you or another staff member could release an updated map of monster locations in the wilderness - no one is going to enjoy running around aimlessly looking for their task. Cool update but the vote shop is empty? Ty for the sick update.